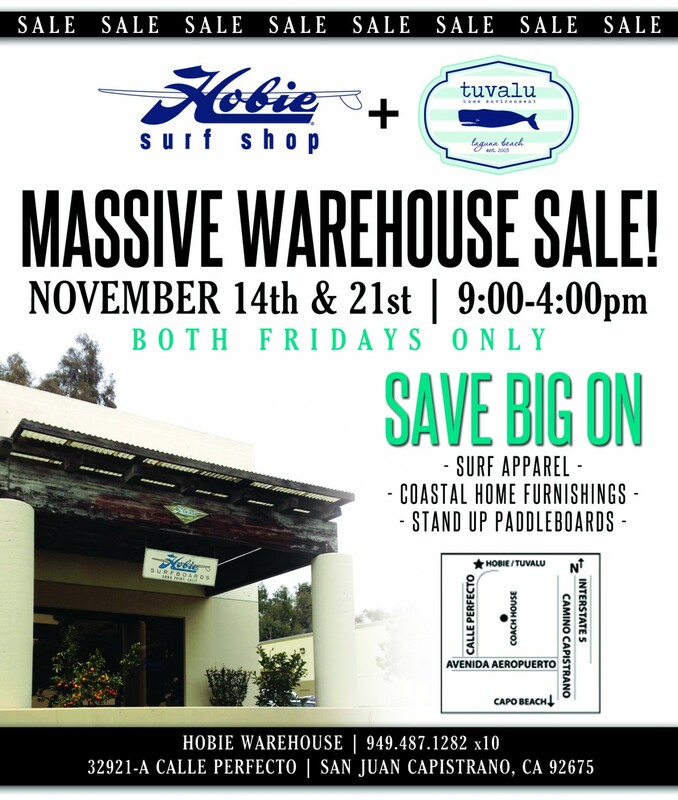 Hobie Surf Shop, Tuvalu, and Hobie Stand Up Paddleboards Massive Warehouse Sale!!!! Your Friday’s just got filled with a lot more Aloha!! For the next two Friday’s ONLY we are emptying out our warehouses and putting it all on sale at HUGE discounts! Special treat, our sister store, Tuvalu Home, is part of the sale too!! Amazing deals on clothing, shoes, accessories, coastal furnishings (especially chairs! You need a seat, we have one for you! ), and SUP’s. We want it all gone! Bring your friends and family and load up for the holidays!! Wild deals on women’s Hobie T’s and Tanks, only $5!! Men’s T’s are all priced at $10!! Nothing is being held back…. call in sick if you have to, but be here! We Can’t Wait to See You!!!! This entry was posted in Hobie Shop, Hobie Surf and tagged california, coastal, hobie, Hobie sale, Hobie Shop, Hobie SUP, Hobie Surf Shop, massive warehouse sale, orange county warehouse sale, Stand Up Paddle, style, SUP, sup sale, surf shop blog, surf shops, Surfing, surfshops, tuvalu home, tuvalu sale, Warehouse sale. Bookmark the permalink.